A lighter summery alternative to classic meatloaf, polpettone di tonno, or Italian tuna loaf, is every bit as tasty if you ask me. Traditionally boiled, a more modern take on this dish is to bake it briefly in the oven, which eliminates a lot of the fuss. Served with homemade mayo, it makes for an elegant antipasto or a light second course. Fresh tuna can be pricey, but because you use equal parts tuna and potato, the dish is actually easier on the pocket book than you might think. Boil or steam the potatoes in their skins until perfectly soft. (You can test their doneness by sticking a paring knife into their flesh; if you can remove the knife without lifting the potato with it, then it’s done.) Let the potatoes cool off a bit, then peel them and pass them through a food mill or potato ricer to make a smooth purée. While the potatoes are cooking, finely mince the tunafish. If you have a meat grinder (or the attachment for a standing mixer) that would be ideal for the job. If not, a food processor will get the job done as well, as will insistent chopping with a sharp knife, if you have the patience. 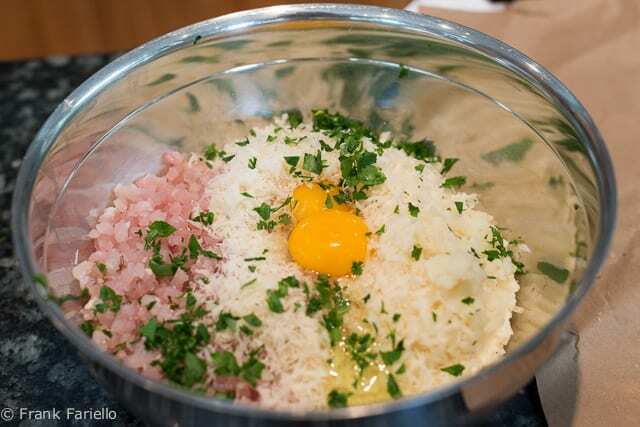 Now place the minced tuna and potato purée along the other ingredients in a large mixing bowl. Mix the ingredients together very gingerly with a spatula or wooden spoon until you have a smooth ‘dough’. Make sure not to over mix, which would work the starch in the potato and render the mixture gummy. Taste and adjust for seasoning. Take the dough and mold it into a loaf-like shape. Then lay down some plastic wrap and lay the tuna loaf on top. 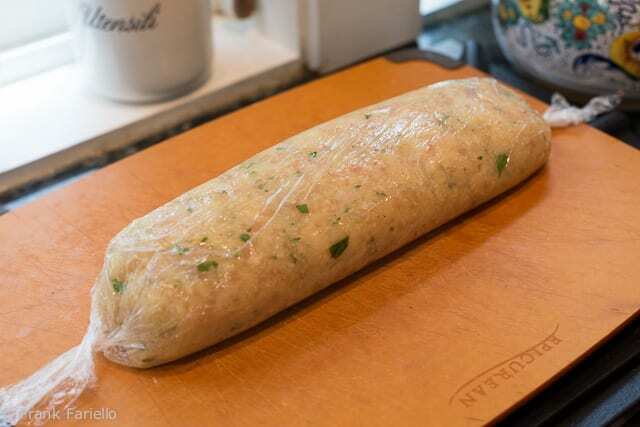 Wrap the plastic tightly around it and twist the ends so that you form a smooth, compact lozonge-shaped loaf. Place the wrapped loaf in the fridge for a good hour or more to set. When you are ready to cook, unwrap the loaf and lay it in a lightly greased baking dish. Coat the loaf lightly with olive oil, using a pastry brush. Bake the loaf in a moderate oven (180C/350F) for about 20-30 minutes, until cooked through and just lightly browned. Let the loaf cool for at least 15 minutes or so before serving. It is also very good—even better in my opinion—served at room temperature. In either case, serve your loaf with some homemade Italian-style mayo on the side. Tuna comes in various varieties and cuts that vary wildly in price. Any will work for this dish, but I would not splurge on dark-fleshed sushi-grade tuna. Save that for sushi or grilling, or some other simply prepared dish where the quality of the fish will really shine through. Good old reasonably priced albacore or the richer tasting yellowfin will do just fine here. The flavorings for this tuna loaf are basically the same ones as for the classic Italian meatloaf and meatballs, just with tuna instead of chopped meat and potato rather than bread for filling. There are other styles of tuna loafs in the Italian repertoire, most commonly eliminating the cheese altogether and flavoring the loaf with more classic fish accompaniments: chopped capers, anchovies and perhaps a few olives. You don’t need breadcrumbs for binder, given the potatoes, but you can roll the loaf in breadcrumbs before you bake if you like a nice, golden crust. 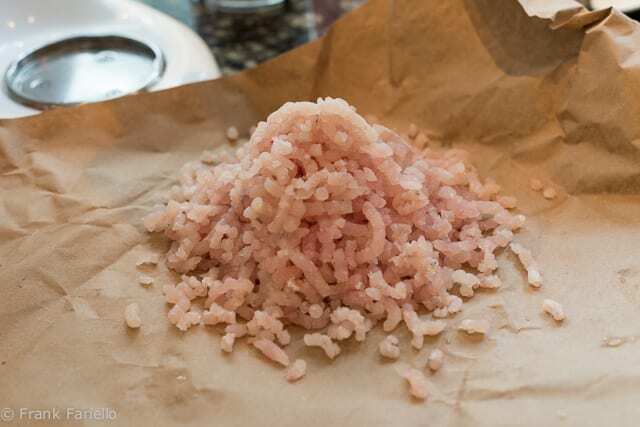 If you don’t have access to fresh tuna, the loaf can also be made with canned tuna that has been mashed with a fork or whizzed briefly in a food processor. As canned tuna has a stronger flavor than fresh, you may want to up the potato:tuna ratio, say to 2:1 rather than the 1:1 ratio given here. And you may want to add an extra egg or two to firm up the mixture. 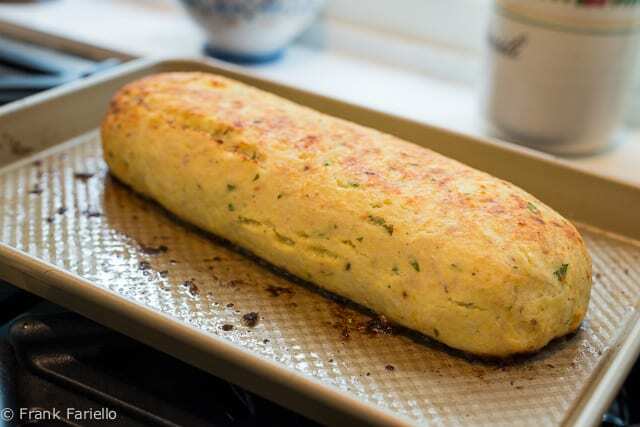 For the old-fashioned boiled version of Italian tuna loaf, take your loaf and wrap it in aluminum foil or, better, cheesecloth instead of plastic wrap. You then simmer it gently in salted water to cover, along with some aromatic vegetables and a slice of lemon if you like, for 20-30 minutes. Although a bit stodgy, boiling does have the great advantage of keeping the loaf nice and moist. Post Scriptum: As with swordfish, tuna can contain some level of mercury, depending on the type. Some types of tuna, in particular bluefin, have been severely overfished (due to its popularity for sushi) and stocks are dangerously low. But, like swordfish, sources say that enjoying tuna as an occasional treat (say once a month) should not do you harm. Boil or steam the potatoes in their skins until perfectly soft. Let the potatoes cool off a bit, then peel them and pass them through a food mill or potato ricer to make a smooth purée. While the potatoes are cooking, finely mince the tunafish. 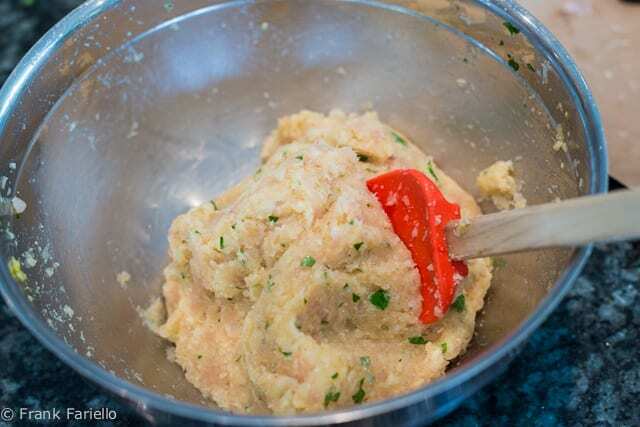 Place the minced tuna and potato purée along the other ingredients in a large mixing bowl. Mix the ingredients together very gingerly with a spatula or wooden spoon until you have a smooth 'dough'. Make sure not to over mix, which would work the starch in the potato and render the mixture gummy. Taste and adjust for seasoning. Take the dough and mold it into a loaf-like shape. Then lay down some plastic wrap and lay the loaf on top. Wrap the plastic tightly around it and twist the ends so that you form a smooth, compact lozonge-shaped loaf. Well, this one too can be a bit dry if it’s’cooked too long. The mayo, of course, helps! Can’t wait to try this! Frank, are regular baking potatoes preferable here over waxier types like Yukon Gold? Yes, definitely, Steve, you want baking potatoes for this one—although Yukons would probably work, anything waxier would not. I would never have thought of making a tuna loaf, but what a great idea, especially for summertime. It certainly “stretches” that pricey tuna. What a nice recipe, Frank. I am intrigued by the idea of using fresh tuna and I like that you chose cooking it in the oven. Have a great week!